What is the difference between BR Glass and Detention Glass? Modern advancements in security glass products have developed to the extent that, as a layperson, it’s easy to get confused between ballistic resistant (BR) and detention glass. Both appear to be virtually indestructible to the untrained eye, but what are the differences between the two? BR and detention glass are made using plastics and sometimes glass. The plastics involved are acrylic and polycarbonate. Acrylics are relatively cheap, weigh half as much as glass, and repel bullets while polycarbonates are more expensive, weigh one sixth as much as glass, and are extremely flexible, so much that they absorb the energy of bullets rather than repel them. These materials come in different forms and thicknesses and may even be used in combination with glass to create glass-clad polycarbonate BR Glass or abrasion resistant detention glass. Glass is excellent for abrasion resistance and clarity, while plastics are stronger and more flexible. Thickness is a big determinate of the resistance of BR and detention glass. A single one-inch thick piece of acrylic is considered bullet-resistant, but polycarbonate is layered to create the desired performance characteristics. In fact, glass-clad polycarbonates often combine heat or chemically strengthened glass with polycarbonate to create high-security detention glass with extraordinary scratch, heat, chemical, and impact resistance. To achieve the same or higher levels of impact resistance, polycarbonates require less thickness than acrylic. Spall, in security glass terms, refers to the tendency of glass struck by projectiles to break into shards that become projectiles. 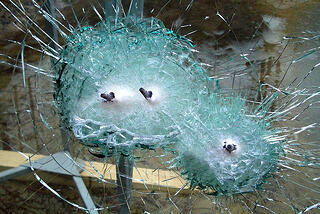 BR Glass therefore requires anti-spall capabilities, whereas detention glass typically does not. While the actual strength of any glass depends on its specifications, the strongest glass available is detention glass. BR Glass is constructed to withstand single or multiple projectiles, yet detention glass must be made to withstand sustained attacks by assailants using different weapons such as blunt and sharp objects, chemicals, and heat. In fact, high-end detention glass can withstand temperatures ranging from -80 degrees Fahrenheit up to 6300 degrees Fahrenheit. An example of the power of detention glass may be seen in this amazing video of a test under the ASTM F1233-08 Standard Test Method for Security Glazing Materials and Systems. Given all the various capabilities available in both BR and detention glass, it’s difficult to know what level of security you really need for your building. Rather than choose on your own, get in touch with the professionals at Signals Defense in Owing Mills, MD. The company has been providing customized security glass solutions for both private and government clients for decades and can help you get the right amount of protection for your business.